The Fitzroy Gardens were set aside as a public reserve, then known as Fitzroy Square, in 1848. Partially cleared and fenced during the 1840s and 1850s, it was not until 1859 that the reserve was laid out and developed as a garden under the supervision of Deputy Surveyor-General Clement Hodgkinson with the assistance of gardener James Sinclair. Fitzroy Gardens retain their original path system, albeit somewhat simplified and resurfaced. They also retain avenues of mature elms which are of national significance in their own right, together with remnants of the 1860s and 1870s mix of conifers and other specimen trees, and examples of ribbon border planting and sub-tropical planting of the late nineteenth century. A substantial collection of nineteenth century buildings also survives within the Gardens. Like many nineteenth century gardens, the Fitzroy Gardens presents a layering of later phases of development, each curator introducing a slightly different landscape style and altering its overall character. In particular, the Gardens underwent major change in the interwar period, with the removal of large numbers of trees and the introduction of a new garden aesthetic. This period also saw the modification of path alignments and detailing and the expansion of the works area, as well as the addition of a number of distinctive new buildings, structures and works of sculpture. The interwar character is still visible to a large degree in the fabric of the place and demonstrates a major phase in its history. Today, the Fitzroy Gardens present as a series of layers that combine to create a cultural landscape of considerable individuality and diversity. The Fitzroy Gardens are of historical, aesthetic, architectural, scientific (horticultural) and social significance to the State of Victoria. 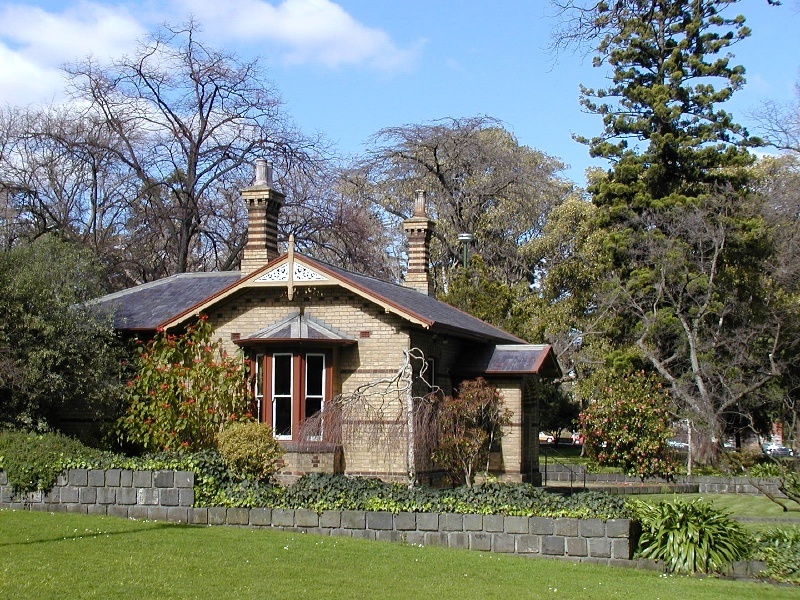 The Fitzroy Gardens are of historical significance as one of a ring of public reserves around Melbourne established in the nineteenth century to provide respite and relaxation for the city's residents. 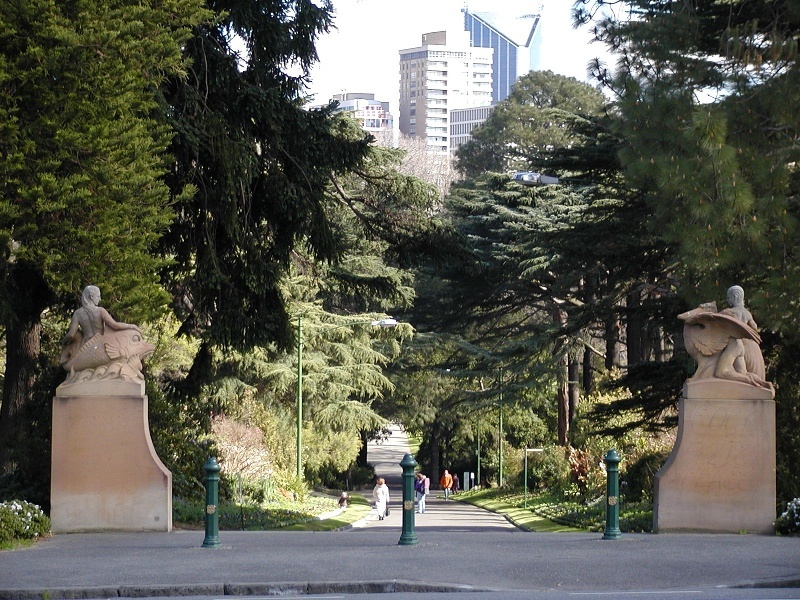 The Fitzroy Gardens have been viewed as the flagship of this group of city gardens, which includes the Flagstaff, Treasury, Carlton and Alexandra Gardens and the Domain. 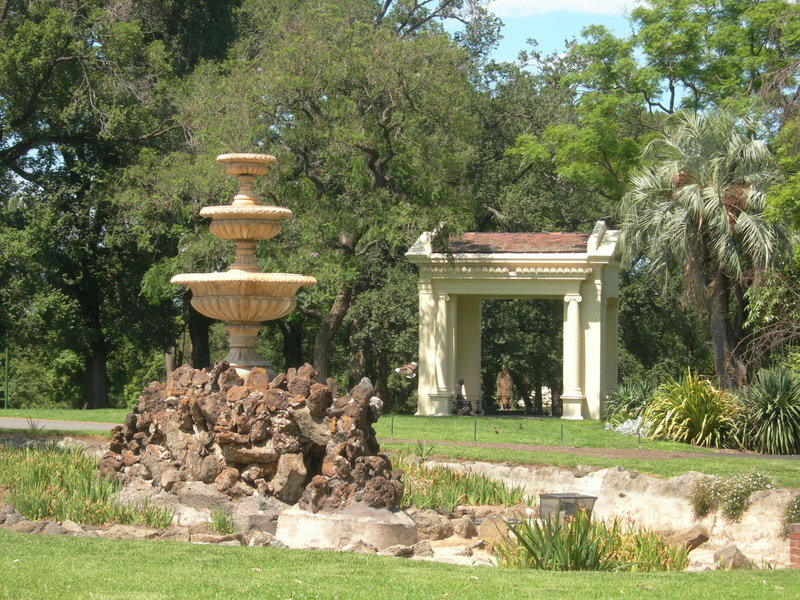 In a statewide context, while not as intact as the Royal Botanic Gardens or the Ballarat Botanical Gardens, the Fitzroy Gardens are an important remnant of the city's nineteenth century garden heritage. They are also a reminder of the city's relatively large investment in public gardens, a reflection of 19th century beliefs about the moral and health benefits of green spaces in often dirty, smelly and overcrowded cities. The Gardens contain several buildings and structures which are of architectural significance in their own right, including the Band Pavilion (1864), the Rotunda (1873), and an early gardener's cottage, Sinclair's Cottage (1866). 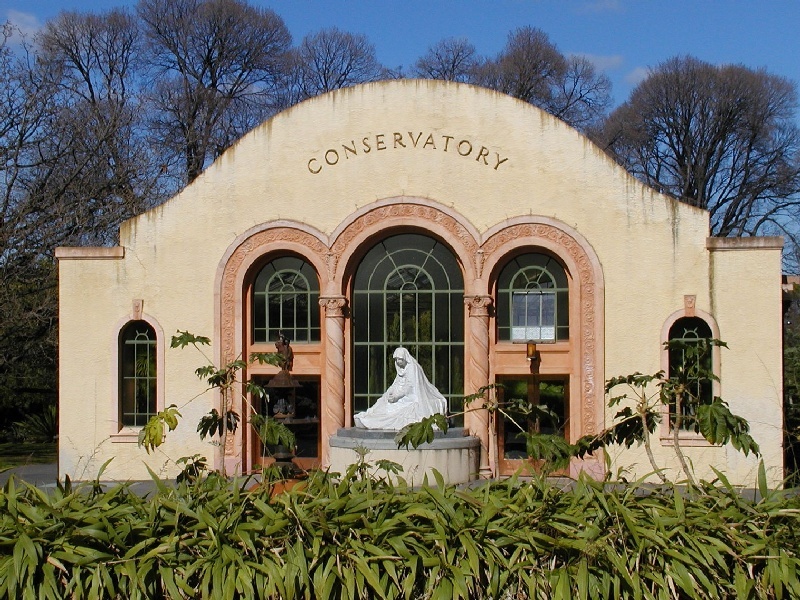 Significant twentieth century buildings include the Spanish Revival-styled Conservatory (1930) and the Electricity Substation (1940). The Fitzroy Gardens are of aesthetic significance for their surviving path system and magnificent avenues of elms and other species, providing a framework for the wide rolling lawns and vistas enhanced by garden structures and floral displays. The general topography that sets most of the gardens below street level, the sense of mystery and enclosure provided by the fern gully, the mound and lake and the majestic spreading specimen trees all combine to give the Fitzroy Gardens their unique character. Fitzroy Gardens are of scientific (horticultural) significance for their outstanding collection of plants, including conifers, palms and deciduous trees. 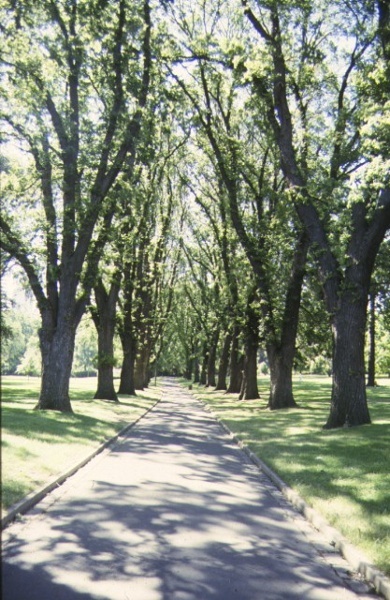 The avenues and rows of about 270 elms, Ulmus procera (English Elm) and U. x hollandica (Dutch Elm) throughout the gardens are some of the best avenues in Victoria. These avenues are of increasing international significance as Dutch Elm Disease has killed most of these species in the northern hemisphere. Other notable trees are: Ficus macrophylla (Moreton Bay Fig), Ficus platypoda (Small-leaved Fig), Quercus bicolor (Swamp White Oak), and the cedar avenue (Cedrus deodara) along the Hotham Walk. Significant individual tree species include a collection of nineteenth century conifers (including pines and Araucarias), the rare Ficus palmata (Indian Fig) and a collection of palms. The Fitzroy Gardens are of social significance because, from their establishment in the early 1860s, the Gardens have been a place of relaxation, passive recreation and entertainment; the Gardens have been the people's park in the city. Attractions such as the indoor horticultural displays in the Conservatory, the Fairies' Tree, Model Tudor Village and Cook's Cottage have provided interest and pleasure for children and adults alike. Both the local and wider communities use the Gardens, which have been and remain a source of great pleasure to the many who frequent them. Fitzroy Gardens, Wellington Parade, East Melbourne, City of Melbourne. Wellington Parade, Landsdowne Street, Albert Street and Clarendon Street. 4. 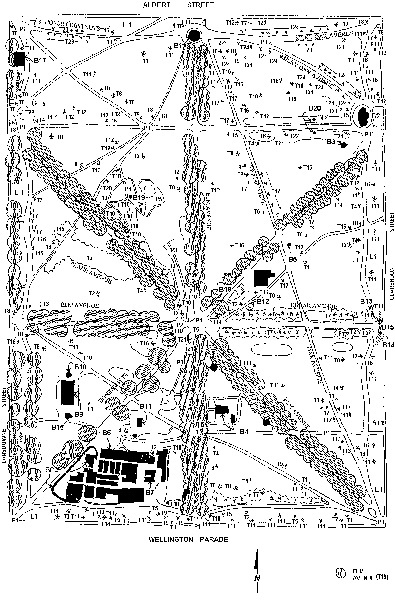 The trees marked as follows on Diagram 605812 held by the Executive Director. The site of the Fitzroy Gardens was reserved in 1848 and by the mid-1860s the laying out and major planting of the gardens had been completed, as well as the construction of paths and numerous buildings. Clement Hodgkinson, Assistant Commissioner of the Lands and Survey Department, and James Sinclair, the Scottish gardener employed at the gardens in the 1860s and 1870s, were chiefly responsible for the initial layout. After Hodgkinson's retirement in 1874, his assistant, Nicholas Bickford, who was appointed Curator of Metropolitan Parks and Gardens in the same year, took responsibility for the Gardens. Others to have subsequent influence on the Gardens' development were John Guilfoyle (1911-1920), the brother-in-law of William Guilfoyle, and John T. Smith (1921-1943). The earliest known planting list in the Gardens was of material obtained from von Mueller from the Royal Botanic Gardens in 1862. 2. Existing elements identified in the Conservation Analysis Report for the Fitzroy Gardens as Intrusive Elements or of No Significance may be removed or internally altered without a permit from Heritage Victoria. 3. Should it become apparent during further inspection or the carrying out of alterations that original or previously hidden or inaccessible details of the place or object are revealed which relate to the significance of the place or object, then the exemption covering such alteration shall cease and the Executive Director shall be notified as soon as possible. 4. If there is a conservation policy and plan approved by the Executive Director, all works shall be in accordance with it. 5. Nothing in this declaration prevents the Executive Director from amending or rescinding all or any of the permit exemptions. 6. Nothing in this declaration exempts owners or their agents from the responsibility to seek relevant planning or building permits from the responsible authority where applicable. * Painting of previously painted walls, posts, and roofing in the same colour. * Treatments to stabilise and protect timber structures. * Repairs, conservation, and maintenance to hard landscape elements, buildings and structures, sculptures, fountains and monuments, steps, paths, roadways and gutters, drainage and irrigation systems, edging, fences and gates. * New or replacement planting which conserves the landscape character, elm, oak, fig and cedar avenues and rows. * Removal of plants listed as State Prohibited and Regionally Controlled Weeds in the Catchment and Land Protection Act 1994. * Maintenance and replacement of play equipment to meet Australian Standards; Playground equipment for parks, schools and domestic use AS 1924; Playgrounds - Guide to siting and to installation and maintenance of equipment AS 2155;and Playground surfacing - Specifications, requirements and test method AS 4422. * Installation, removal or replacement of garden watering and drainage systems. General Conditions: 1. All exempted alterations are to be planned and carried out in a manner which prevents damage to the fabric of the registered place or object. General Conditions: 2. Should it become apparent during further inspection or the carrying out of works that original or previously hidden or inaccessible details of the place or object are revealed which relate to the significance of the place or object, then the exemption covering such works shall cease and Heritage Victoria shall be notified as soon as possible. Note: All archaeological places have the potential to contain significant sub-surface artefacts and other remains. In most cases it will be necessary to obtain approval from the Executive Director, Heritage Victoria before the undertaking any works that have a significant sub-surface component. General Conditions: 3. If there is a conservation policy and plan, all works shall be in accordance with it. Note: A Conservation Management Plan provides guidance for the management of the heritage values associated with the site. It may not be necessary to obtain a heritage permit for certain works specified in the management plan. General Conditions: 4. Nothing in this determination prevents the Executive Director from amending or rescinding all or any of the permit exemptions. General Conditions: 5. Nothing in this determination exempts owners or their agents from the responsibility to seek relevant planning or building permits from the responsible authorities where applicable. Regular Site Maintenance : The following site maintenance works are permit exempt under section 66 of the Heritage Act 1995: a) regular site maintenance provided the works do not involve the removal or destruction of any significant above-ground features or sub-surface archaeological artefacts or deposits; b) the maintenance of an item to retain its conditions or operation without the removal of or damage to the existing fabric or the introduction of new materials; c) cleaning including the removal of surface deposits, organic growths, or graffiti by the use of low pressure water and natural detergents and mild brushing and scrubbing; d) repairs, conservation and maintenance to plaques, memorials, roads and paths, fences and gates and drainage and irrigation. e) the replacement of existing services such as cabling, plumbing, wiring and fire services that uses existing routes, conduits or voids, and does not involve damage to or the removal of significant fabric. Note: Surface patina which has developed on the fabric may be an important part of the item's significance and if so needs to be preserved during maintenance and cleaning. Note: Any new materials used for repair must not exacerbate the decay of existing fabric due to chemical incompatibility, obscure existing fabric or limit access to existing fabric for future maintenance. Repair must maximise protection and retention of fabric and include the conservation of existing details or elements. Fire Suppression Duties : The following fire suppression duties are permit exempt under section 66 of the Heritage Act 1995, a) Fire suppression and fire fighting duties provided the works do not involve the removal or destruction of any significant above-ground features or sub-surface archaeological artefacts or deposits; b) Fire suppression activities such as fuel reduction burns, and fire control line construction, provided all significant historical and archaeological features are appropriately recognised and protected; Note: Fire management authorities should be aware of the location, extent and significance of historical and archaeological places when developing fire suppression and fire fighting strategies. The importance of places listed in the Heritage Register must be considered when strategies for fire suppression and management are being developed. Weed and Vermin Control : The following weed and vermin control activities are permit exempt under section 66 of the Heritage Act 1995, a) Weed and vermin control activities provided the works do not involve the removal or destruction of any significant above-ground features or sub-surface archaeological artefacts or deposits; Note: Particular care must be taken with weed and vermin control works where such activities may have a detrimental affect on the significant fabric of a place. Such works may include the removal of ivy, moss or lichen from an historic structure or feature, or the removal of burrows from a site that has archaeological values. Landscape Maintenance : * The process of gardening, including mowing, hedge clipping, bedding displays, removal of dead shrubs and replanting the same species or cultivar, disease and weed control, and maintenance to care for existing plants. * Repairs, conservation, and maintenance to hard landscape elements, buildings and structures, fountains and monuments, steps, paths, paths and gutters, drainage and irrigation systems, edging, fences and gates. * Removal of dead or dangerous trees and vegetation, works to maintain fire safety and to conserve significant buildings and structures and emergency works, provided a report is submitted to the Executive Director within 21 days. * Replanting the same plant species which conserves the significant landscape character and values including specimen trees, avenues, rows, shrubberies, flower beds, and lawns, provided a list and plan is submitted to the Executive Director for approval. * Management of trees in accordance with Australian Standard; Pruning of Amenity Trees AS 4373-1996. * Management of trees in accordance with Australian Standard; Protection of Trees on Development Sites AS 4970-2009 * Subsurface works involving the installation, removal or replacement of watering and drainage systems or services, outside the canopy edge of significant trees in accordance with .AS4970 and on the condition that works do not impact on archaeological features or deposits. * Removal of plants listed as noxious weeds in the Catchment and Land Protection Act 1994 * Vegetation protection and management of the possum and rabbit population. * Repainting the same colour of previously painted surfaces Public Safety and Security : The following public safety and security activities are permit exempt under section 66 of the Heritage Act 1995, a) public safety and security activities provided the works do not involve the removal or destruction of any significant above-ground structures or sub-surface archaeological artefacts or deposits; b) the erection of temporary security fencing, scaffolding, hoardings or surveillance systems to prevent unauthorised access or secure public safety which will not adversely affect significant fabric of the place including archaeological features; c) development including emergency stabilisation necessary to secure safety where a site feature has been irreparably damaged or destabilised and represents a safety risk to its users or the public. Note: Urgent or emergency site works are to be undertaken by an appropriately qualified specialist such as a structural engineer, or other heritage professional. Signage and Site Interpretation : The following Signage and Site Interpretation activities are permit exempt under section 66 of the Heritage Act 1995, a) signage and site interpretation activities provided the works do not involve the removal or destruction of any significant above-ground structures or sub-surface archaeological artefacts or deposits; b) the erection of non-illuminated signage for the purpose of ensuring public safety or to assist in the interpretation of the heritage significance of the place or object and which will not adversely affect significant fabric including landscape or archaeological features of the place or obstruct significant views of and from heritage values or items; c) signage and site interpretation products must be located and be of a suitable size so as not to obscure or damage significant fabric of the place; d) signage and site interpretation products must be able to be later removed without causing damage to the significant fabric of the place; Note: The development of signage and site interpretation products must be consistent in the use of format, text, logos, themes and other display materials. Note: Where possible, the signage and interpretation material should be consistent with other schemes developed on similar or associated sites. It may be necessary to consult with land managers and other stakeholders concerning existing schemes and strategies for signage and site interpretation. Mineral Exploration : The following Mineral Exploration activities are permit exempt under section 66 of the Heritage Act 1995, a) mineral Exploration activities provided the works do not involve the removal or destruction of any significant above-ground features or sub-surface archaeological artefacts or deposits; b) preliminary non-intrusive exploration, including geological mapping, geophysical surveys, and geochemical sampling and access to shafts and adits; c) advanced forms of exploration (drilling), including the location of drill pads and access tracks where this has been the subject of on-site negotiation and agreement with representatives of Heritage Victoria, DSE and Parks Victoria, and where all significant historic site features have been identified and protected as part of an approved work plan. Minor Works : Note: Any Minor Works that in the opinion of the Executive Director will not adversely affect the heritage significance of the place may be exempt from the permit requirements of the Heritage Act. A person proposing to undertake minor works must submit a proposal to the Executive Director. If the Executive Director is satisfied that the proposed works will not adversely affect the heritage values of the site, the applicant may be exempted from the requirement to obtain a heritage permit. If an applicant is uncertain whether a heritage permit is required, it is recommended that the permits co-ordinator be contacted. The importance of the Fitzroy Gardens lies primarily in its layers of development which combine to create a cultural landscape of considerable individuality and diversity. 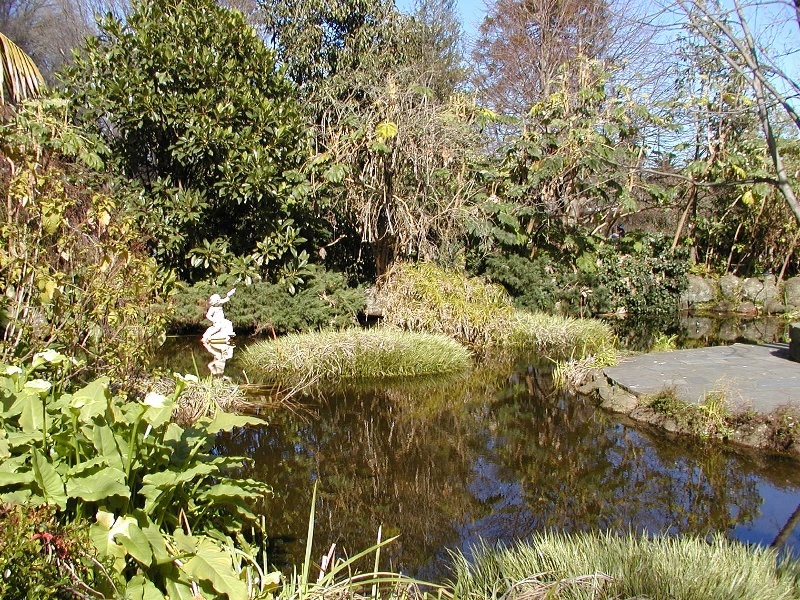 The Conservation Analysis for the Fitzroy Gardens (December 1998) prepared on behalf of the City of Melbourne by John Patrick Pty Ltd, Allom Lovell & Associates and Hansen Partnership identifies elements of Primary Significance and Contributory Significance worthy of conservation and protection. Intrusive Elements and Elements of No Significance have also been identified in the Conservation Analysis being elements which do not contribute to the cultural heritage significance of the Fitzroy Gardens.